They'll welcome too his pledge to "roll back the spectre of a warming planet". For scientists, neither will come a moment too soon. Scientists and engineers feel they need all the support and inspiration the new president can spare them. They will play a vital part in helping Obama to keep another promise he made today, to "harness the sun and the winds and the soil to fuel our cars and run our factories". Quite a change in tone from the past eight years. During the Bush presidency, the world saw the Arctic ice cap shrink to a record summer low, the relentless rise of greenhouse gas emissions, and warnings from scientists shift from urgent to panicky. President Bush came to power at the start of a new decade, a new century and what many thought would be a new era for science. The news that scientists had pieced together an early draft of the Human Genome had given a palpable lift to the end of the Clinton presidency. But in climate change and other key challenges of science, Bush wouldn't listen to the scientists. He didn't like their view of the world, and he didn't like what they were saying. Religion, or at least the religious vote, informed Bush policy... His very public distaste for stem cell research mattered because it raised public suspicion of science. Creationism has grown stronger, to the point that more Americans now believe in biblical creation than evolution. "God calls on us to shape an uncertain destiny", Obama said. But there was reference too to non-believers. And if he really does raise science back to its proper place in society, he will help to restore confidence among scientists as much as for the whole of American society. Scientists have grown used to attempts to silence them. Now, they're speaking out again. Unlike economic recession and wars - which pass, they say - climate change does not. And there are deadlines if we want to avoid a point of no return. Just last week a Nasa scientist, Jim Hansen, whom Bush had tried to silence in the past warned that Obama has just four years to save the world. But unlike Bush, Obama does listen to scientists. He's already promoted many to top advisory positions... crucially on energy policy. There's some squabbling over whether cap-and-trade or a carbon tax is the best way to cut greenhouse emissions, but at least the Obama team agrees on the goal. For some, the coincidence of the recession and Obama coming to power could truly prove to be the world's last, best chance to solve the energy and climate security equation in a way that avoids destructive changes in global temperatures. He inherits a unique opportunity. And this year, of all years, leadership matters, because the world hopes to thrash out a global deal to cut emissions. If Obama does stick to his promises on energy efficiency, renewables, carbon capture and storage and hybrid vehicles, he will have acted to ensure that the recovery, when it comes, isn't stalled as soon as it starts by a rapid raise in oil prices. And he will have helped in no small part to loosen the grip that fossil fuels hold on all our lives. In Japan you don't get on a board of a company without being an Engineer from a solid Engineering background. Look at Honda, Toyota et al and they are all run by people with solid Engineering/Scientific backgrounds. In the UK Engineering & Science is held in such low regard and it nevers ceases to amaze me just how many salespeople, failed Meedja luvvies and other PR types end up running UK companies that have Science/Engineering at their core but about which the people running those companies do not have a clue. Perhaps it is the fault of the Engineers who see little point in playing the pathetic games of UK Corporate ladder-climbing and back-stabbing. The tragedy though is for the UK and the cold reality is that we will never have a British Google or Microsoft here partly because of the appalling esteem UK Engineers and Scientists are held in, partly because of a punitive tax system and, it must be said, partly because of the existence of the BBC - i.e. if Google had been a British company then as soon as it had the slightest success some tax-payer funded BBC grey suit would have taken a part of the licence fee and, with no business risk because they would have been using public funds, done the same thing thereby driving the private sector company out of business. The BBC is such a block on so many Internet and Media related business ventures but, as they used to say on 'Tales from the River Bank', that is another story. BUT WHAT OF PSYCHOLOGICAL SCIENCE? Is Obama savvy enough to be wary of his own motivation? I watched his inauguration delivery and have now read the transcript. It has the feel of a man 'being great'. Add to that the 'Lincoln theme': bible, train, pudding (what else?) and I get uneasy. Margaret Thatcher had that 'Churchill reincarnated' thing and a bizarre war resulted ending in a 'famous victory' over an isolated island. The end of Obama's speech seemed to speak of America standing firm against EXTERNAL threat of annihilation, sort of on a par with Britain after Dunkirk. I get the impression that his, reportedly, wide reading, did not cover human psychology. Messiah, know thyself. Was this supposed to be an objective and impartial article!? Watt assumes all scientists are democrats, this is complete nonsense. She also presents the theories surrounding global warming as a given fact, despite the fact many scientists don't agree that man is the cause of global warming. Watts portrays Bush as someone who silenced scientists, it's just nonsense and typical of the pro-Obama culture bias at the BBC. How can Susan Watts deliver the statement that 'scientists CALCULATE Obama has four years to fix climate change'? Any scientist saying such things should have his chemistry set confiscated and be made to stand in the corner. Perhaps Rummy Rumsfeld could be brought out of retirement to lecture such 'scientists' regarding 'unknown unknowns' before they do anymore computer modelling and wild prediction. Bush wasn't against stem cell research - he was against the creation of embryos for stem cell research. Time and science appears to have proved him right. There have been some astounding feats done with adult stem cells. Perhaps you should read this BBC report of what Bush actually said on the matter when it originally came up. How can Jim Hansen claim Obama has 4 years to save planet Earth when his own data is fudged and inadequate and the computer models don't agree with the real world? You claim Bush doesn't listen to scientists. You know that isn't true. He just doesn't agree with the same ones you do. I see no problem in non-scientific people running large science based companies. Running a company takes expertise in client relations, economics, sales, politics (sadly), in fact just about everything EXCEPT science. You would not employ a CEO to work in the labs, so why would you employ a scientist to run the company? Pick the right people to do the right job. And remember, some of the worlds most successful companies are both British and are science/engineering based businesses. On the matter of Obama being more open to science, I think it is wrong to say that George Bush was influenced by the religious right particularly - in the case of global warming it was his oil rich friends. In the end he turned his back on them, which is not mean feat in the US. And religion will still hold sway over much in American society. "God Bless America" is the slogan for a good reason - most Americans believe it to their core. Obama cannot ignore this sort of background belief in the US voter - even is many of us wish he could! As one who, having already had to cope with various vastly funded quango (though what is the BBC really, but the biggest of them all?) efforts set up without the concerns most businesses face, found himself competing... commercially... with BBC Green. I was co-funding a direct competitor! A story worth telling? But... by whom? There are some who can be... 'selective'... with what gets reported... when it suits. And as any scientist will tell you, as with news, that tends to rather compromise the value of what is published and those behind it. I find it interesting that straight faced susan and gladiator are still perpetuating the myth that not all scientists agree on global warming. The fact is that scientists respect the IPCC panel and their findings and have concurred with it - the FACT is that Man is ruining the planet and that we have to take the blame for global warming. Its time the uninformed stopped saying that there is doubt - there is not. President Bush found this distasteful and rejected it beacuse his friends companies made more money by ignoring environmental restrictions. He was foolish and his record on science does not bear a cursory scrutiny - he was anti-science and motivated more by religious concerns than by secular ones. This is a disastrous policy for anyone in power in the 21st century. As to four years to save the planet, perhaps we have a little more, but many scientists have already warned that we need to act now - not by 2050 when it will be too late to stop the planet warming by up to 5 degrees or more. President Obama has a lot to achieve, and putting science at the forefront of policy and use it to attempt to solve some of our problems is the only way that the world will sit up and take notice. America has to, at long last, start setting the example. President Obama has a unique opportunity to do this. Science is not an opposite to religion. Certainly Bush believed the two opposed -- as did that brand of religionists who so fanatically supported him. But I don't think this is a generally correct or helpful view; and I don't think it is Obama's view. I am not sure if it was the intention of the author, but this article seems to implicitly accept a rather Bush-era Manichaen dichotomy betwen the two. "But there was reference too to non-believers. And if he really does raise science back to its proper place in society, he will help to restore confidence among scientists as much as for the whole of American society." seem to imply that science is (at least mainly) the property of 'non-believers'. I think perhaps this was merely intended to show that Obama no longer intended to pander to the 'religious right'; and therefore might be free to court scientists. However, I think that presenting the issue in this way allows Bush's black-and-white view of the world to go unchallenged; and under-represents the subtlety of Obama's position. Obama is a religious man. (Certainly if we take him at face value -- I see no reason to refuse to do so.) The article quotes him as saying "God calls on us to shape an uncertain destiny". Barack Obama, at least, does not believe that religion and science are opposites and conflict; and does not respect "non-believers" or mention them (in a very different part of his speech) merely because they are the scientists, the golden geese who lay the precious egg of learning. Opening a paragraph on how he might restore science to its rightful place with a remark on his respect for non-believers therefore seems a little incongruous. Very frequently Obama has claimed to a politician of unity. In fact, in many ways, he claims to be the the candidate of synthesis, after the thesis and antithesis of Red/Blue debates. Frequently commentators have cast doubt on this claim. However, here is one place where I think Obama really does represent a synthesis of an increasingly polarised debate -- the artificial conflict that various people have set up between science and religion. I think we would be very wrong to put the fact that he is both religious and scientific down to him being an American from a religious America; as if it were some sort of quaint North American picadillo. Speaking as someone who considers himself a trained scientist, a practicing mathematician, *and* in some small way religious, I am inspired to see someone else with respect for both ideas in such a prominent position. Dull accountant man - if you were a scientist, rather than an accountant, you'd know that time and science have not proven Bush right regarding stem cell research. While useful research has continued to be done on the pre-existing lines, this doesn't mean the US isn't missing out on a wide range of research. The five countries that, as a proportion of their biomedical research, are the most successful in research on human stem-cells are Singapore, the United Kingdom, Israel, China and Australia. All allow the creation of new embryonic stem-cell lines. Even where Bush got things mostly right - e.g. the President's Emergency Plan For AIDS Relief (PEPFAR) - his bowing to non-scientific pressures has reduced the success - pandering to the religious right and their abstinence obsession has stopped far more practical and realistic family-planning groups from integrating with those receiving PEPFAR funds. So it is .17 degF higher than the average. That is within normal variation. This is why AGW is not garnering more support. Temperatures back to average, high sea ice at the S pole, and record N. hemisphere snow cover is not what I'd call anecdotal but rather broad and tellling descriptions of todays condition. I have a degree in health admin from Duke. I can also read thermometers. And that's the point. From a laymans perspective, and looking at the scientist's data, PART of the scientific community seems to be screwing this up badly. You say "Scientists have grown used to attempts to silence them" and you are right - it has been a disgrace. You seem not have noticed though that the calls for silencing scientists (along with regular demands for their dismissal and even imprisonment) have come from the alarmist camp that you appear to support. Perhaps that's because you never venture beyond climate propaganda sites for your information. At present, Obama's "scientists" are a sorry looking bunch, being advocates of a hypothesis lacking any scientific rigour, testable data or evidence worthy of the name, but reliant on climate model projections that can be made to produce any required result. You call this science? As for Hansen, his NASA department has been heavily criticised both inside and outside the US government for unscientific practice bordering on misrepresentation, using data proven unfit for purpose, while fighting for years to prevent it being released for independent scrutiny. Frankly, his influence over climate science has been a disgrace. It is clear that the AGW hypothesis has increasingly serious problems with scientific credibility, and Hansen's claim that there are just four years to "save the planet" is either insane, or a desperate attempt to influence policy before his case collapses. The latter is inevitable - why join a sinking ship? "reliant on climate model projections"
Untrue. We know that CO2 levels are rising - no-one disputes this. And we know that CO2 absorbs infra-red radiation. Given this, it would be a surprise if rising CO2 levels didn't lead to a rise in temperatures. It's basic physics - not reliant on climate models at all. The models attempt to predict how temperatures will change, but even without the models we would still know there is a problem. "What is the evidence that CO2 is causing global warming?" "The Models are Unproven (response)"
But the Earth's place in the 'greater scheme of things' may not be properly described by the 'Big Bang' model. If you care to pick up on over half a century of alternative science, search 'Electric Universe'. Not just climate change but space shuttle and air liner viability, and a whole lot more. When Human Beings first walked upright on the planet there were much higher levels of CO2 in the atmosphere than today. In fact, the Human Body needs a certain amount of CO2 in the body in able to breathe and live - without CO2 none of us would be here. There are some researchers now linking lower CO2 levels in certain people with the growing millions who are suffering from Asthma and Hyperventilation Syndrome. It is known that CO2 is lower in people with these illnesses than in those who are healthy. Perhaps Mother Nature has worked out that we have all made ourselves ill with stress, anxiety and worry, have "blown out" too much CO2 and hence is trying to help us out by raising CO2 levels? OK, perhaps a wacky idea but an idea actually based in hard science and medical fact - the bit about low CO2 levels in Asthma sufferers and all Humans needing CO2 to simply live - and just maybe some of us should be questioning what is now delivered to us as hard facts and saying "Hang on a minute, if...?". Have any actual physical studies been done to quantify the effect changes in CO2 have on our atmosphere? Not just quantifying the energy CO2 can absorb, but actual data on how much trace amounts can absorb in competition with all the other constituents of our air. There is only so much energy passing through the atmosphere that can be absorbed and much of it gets absorbed by water vapour. It can't be that difficult. Some sealed greenhouses with different concentrations of CO2 in them would be a simple enough test to start with. Changes in land have been ignored until recently. The sheer variety of feedbacks the climate creates cannot yet be sufficiently modelled. (And in some cases the expected feedbacks have been found to be the reverse of the models) The number of weather data stations both vastly skew the data to reflect the northern hemisphere climate and have plummeted in number recent decades. (Particularly in Canada and Russia.) They also do not collect surface data from the 2/3rds of the earth covered by water. Satellites do. But satellites show both a short time frame, and a statistically insignificant change in global temperatures. That is why Hansen prefers the surface station data. Yet for a relatively small figure the surface station could be vastly upgraded and better distributed. We should make every effort to collect good quality data but it isn't being done. If scientists were honest enough to admit we don't know enough and that models aren't the be all and end all of climate science we would begin getting somewhere. Instead both pro and anti man made climate change groups tend towards the extreme positions in order to get attention, and more importantly, funding. (eg It's all man's fault and we're all gonna die v It's all the sun's fault and we can pollute as much as we like) Deniers/sceptics being funded by big oil is certainly a fair charge to make, yet no one ever seems to question the pro-warming brigade being funded by Governments who will hardly balk at more reasons to tax us and more reasons to interfere. Reason and common sense went out the window years ago. None of this removes the economic benefits from encouraging energy efficiency and more considerate use of the planet. Nor does it remove the environmental benefits of helping developing nations. They can take leaps in energy efficiencies by obtaining modern technology rather than take the small steps the West has taken over the last 2 centuries. This should come about through free trade - allowing developing nations access to our markets so they can then enjoy the prosperity we do, and afford the cleaner technologies we have. It would raise their standards of living almost immeasurably. Ultimately most of the convenient sources of power are finite and it's in everyone's interests to make them last as long as possible. At times the proposed solutions to the threat of climate change seems almost anti-human. They would keep the developing world poor and make them more reliant on hand outs than they already are. They would depress an already struggling golbal economy. They would cause food prices to rocket. The solution to James Lovelock's perceived population bomb appears to be taking hold. Yet our world leaders and prominent scientists, while seeking to address the risk of not doing something are ignoring the risk of doing the wrong thing. For a world apparently so hungry for change the various world leaders sure seem keen to maintain the status quo of 'us rich, them poor'. Change will happen whether we like it or not. How we adapt to those changes will be what makes the difference. And how 'VARIOUS' they are - and yet so similar. Take any of them and look behind the mask (unless as with our recent bunch they are transparently off-centre) and you will find desperately unsettled, disturbed, obsessed, deranged, needy etc. individuals, attempting to shake the phantom tin from their tails by acquiring power. The difference between a Mugabe and a Cameron is a lot less than between a Cameron and the bloke on the Clapham Omnibus, contentedly going home for tea. With leaders like this what chance followers? "When Human Beings first walked upright on the planet there were much higher levels of CO2 in the atmosphere than today." "without CO2 none of us would be here." That's true, no-one disputes that. Without any CO2 or other greenhouse gases, the Earth would be too cold to support human life. You don't want too little, and you don't want too much. "What is your source for this? From what I've read, it appears that CO2 levels are higher now than they've been in 20 million years." If you simply do a Google for "Hyperventilation CO2" or "Asthma CO2" you probably will find the information if you read through various scientific and medical articles online which relate to it. Google is our friend. Also look up the Bohr effect designated by Christian Bohr in the early 1900s which I think every would-be GP has to swat up on - well, one would hope they do. Those claiming that CO2 levels now are higher than they have been for millions of years simply are ignoring what it took for Human Beings to evolve in the first place and in what circumstances on the planet - once filled with much more CO2 than now - we actually first began to, deep breath now, breathe. If you had 100% oxygenated blood with no CO2 you would be very ill if not dead. The Human lungs evolved to utilise CO2 and if we did not create our own CO2 now we all would be ill if not dead. Asthmatics and those suffering from Hyperventilation Syndrome (HVS) often have much reduced levels of CO2 from over-breathing - i.e. giving out too much CO2 and not getting enough back in. Newsreaders, as perhaps we witnessed on the BBC the other day, are very prone to HVS which can lead to Anxiety, tight throats, tight chests, breathlessness, Panic Attacks, some even nastier symptoms and also, eventually, Asthma. The Human nose and the Human lungs have evolved to help reduce the loss of CO2 from the body. Have a look at all the people you work with, pass in the street, etc, and notice tomorrow just how many of them are 'good' nose-breathers and 'unhealthy' mouth-breathers - the latter are over-breathing and losing too much CO2. Newsreaders, who often gulp in air through their mouths in order to have enough 'breath' to read long pieces of text from the autocue and then subsequently gulp out CO2 via their mouths, are prime candidates for HVS as are most who are Type A Personalities. If you are a Type A Personality who rads the News, as probably most are, then... oh dear. Anyhow, as I said, maybe Mother Nature knows best? tawse57, when I asked about your source, I was asking for the source of your claim that CO2 levels were higher in the last few million years (when humans evolved). 1) Humans need a certain level of CO2 to live. I don't dispute this. 2) Low CO2 in the air can lead to asthma/hyperventilation. Don't know if this is true or not, the first result on Google for 'hyperventilation co2' does not support it. 3) Therefore, levels of CO2 were higher during the early stages of human evolution. This does not follow - especially since CO2 is currently rising, so under your hypothesis, fewer people should be having problems with asthma. If you're so confident about man-made global warming, why on earth did you (or your team) feel the need to splice paragraphs 16 and 22 of Obama's speech to make him appear to say something other than what he did? Thank you 'fjpickett'. It seems the message could have been clearer after all - at least in order to meet Susan's agenda! I also note that a 'spectre' (as in "… spectre of a warming planet") is not a scientific thing. It is something which is not really there - and is probably in the mind. Still, they do need something to scare us with - in order that we accept more of their wretched taxation. I'd like to hear more from proper scientists too. Not these arrogant propagandists who profess precise knowledge of exactly what is going to happen in X years time, or can calculate how many years Obama has to save the world. What a laugh! I wonder how the world ever managed to survive all those other billions of years without Obama?! why on earth did you (or your team) feel the need to splice paragraphs 16 and 22 of Obama's speech to make him appear to say something other than what he did? Trusting that this claim is accurate (all sorts can happen in the edit suite these days - evidently - but it comes to something when I give more credence to some bloggers than the £3.5B, multi-thousand strong national broadcaster and its penchant for 'interpreting events') I'd be interested in the reasoning behind this, too. Or is it one from the 'Emerging Truth' school of reporting? The first 17 seconds of that essay just go to show just how much the alarmist rely on half truths and deception. I wonder if you'd care to reply to the earlier commenters questions about splicing of President Obama's speech? Please note the change from the full version of the speech and the edited one. ""We will restore science to its rightful place, roll back the spectre of a warming planet. We will harness the sun and the winds and the soil to fuel our cars and run our factories." You spliced two parts of a speech and in effect changed the message. Cheeky at best. A bit shoddy if you ask me. Cheeky at best or a bit shoddy is understating the magnitude . The Presidents Innauguration speech is a document of record in the Congressional library , falsely reporting another nations historical record is scandalous. Sadly, just another example of the atrocious standards of a once proud organisation. Why did you splice together two separate pieces of this historic speech - I find this staggering. Don't think that just because you believe you're doing 'the Lord's work' that you can do this and get away with it. I love the BBC, but what you're doing just plays into the hands of those who would like to see it destroyed. This is appalling and is one of the first things you learn not to do on your first day at journalism school. And you wonder why the public are increasingly sceptical about this whole silly theory. You do science a great disservice. Should add: expect repercussions over this. You've let the BBC down. Here is the link to the actual Susan Watts report. The edited speech is used right at the start. Or anyone from the editorial team who might one day get around to reading and taking an interest in their own blogs? It does seem a fairly important issue to deal with, and just hoping it drops off the pages and goes away is rather unsatisfactory. My national broadcaster deciding to lift chunks of material and rearrange them, from the direction our monarch takes at photo shoots to the words of the new US President... 'to enhance the narrative'... in news items especially, is a matter of some concern to me. Mind you, I guess with the onset off 'global warming' there will be a lot more tumbleweed bouncing down empty, dusty streets. A deafening silence from Ms Watts so far. I can't decide right now which bothers me more - this splicing and dicing of the most eagerly awaited speech in history, or the refusal of the BBC to broadcast an appeal for the survivors of the massacre in Gaza! Has the BBC got a deathwish? President was saying. You can look for yourself above. Apologies for not responding sooner. I thought I had. BBC Editors find this blogging software frustrating at times too. What absolute twaddle , you have misrepresented a hitorical speech to suit your own ends . This is totally unacceptable and hopefully a full public apology and explanation of what you did will be aired on Newsnight. Anything less and I ( and others I know ) will be making formal complaints. "It in no way altered the meaning or misrepresented what the President was saying"
Really? I wonder if the President's lawyers would see it that way? This is directly comparable to the video editing that showed the Queen 'walking out' of a portrait session, but you guys are so used to 'slicing and dicing' (in the BBC's own words) to fit things into suitable slots/agendas that you don't see the damage it can do. It's no good blaming the computers, either! I don't for one second believe that you believe that. It would be clear to almost anyone that it had an enormous effect (in distorting the truth). Even if you had made the cuts and fade clearer, for example by using video of Obama himself and cutting to different views; you would still be guilty of taking phrases *completely* out of their original context. My complaint has already been submitted to the BBC. It does seem strange to take different parts of the speech and put them together. Each segment should be set in its own context. The composite version has such brief pauses that it sounds as though Obama is saying them all together. Nothing in the presenter's words explains that it is a composite. There is only one impression open to the viewer and that is that Obama said the whole soundbite together. This is rather different to the reality, which is that he made just three brief references to science. He referred to the "spectre" of climate, which actually suggests a slight lessening of its importance, if anything. Viewers deserve an explanation on air. Utyer rubbish Mr Rippon. The BBC have distorted the facts. This is totally unacceptable and I shall be making a formal complaint. WRT the title of this piece, what about restoring journalism to its rightful place? I've listened to the adjusted version of Obama's speech several times now, and I think what has been described as fades between each segment could equally be construed as natural pauses to draw breath. I suspect that many people who are unaware of this controversy and who haven't read the full official transcript, will have gone away believing that this is the way he actually said what he said. Which means, basically, that they would have gone away believing a falsehood. 1. There is no fade audible. 2. The splice rearranged sentences to distort the meaning to suit a global warming agenda. That's fakery, pure and simple. 3. The report without the fakery is pure propaganda, eg by distorting Bush's policy on stem cell research to which Bush has no objection. He objects to new embryos being used for stem cell research. So do and I'm agnostic. Propaganda and distortion - now what? ....or may I call you Susan-I feel I already know you, having seen your name spread all over the blogosphere. Rather ironic that someone behind the news should now be making it. I do not intend to add to your discomfort-after all, you know and I know that you do not splice two things together without telling anyone. Unless of course your name is Dr Mann and you intend to foist the infamous hockey stick graph on the world. Can I suggest a way in which I (and I am in the majority) can have my concerns at your actions expresed, whilst making great television? "Did co2 kill the planet?" Imagine the scene. A high court judge. Barristers representing either side of the great divide. Expert witnesses giving their evidence under oath. In depth debate. The judges summing up. The verdict. For the first time anywhere in the world a rigorous public examination of the facts! Facts-isn't that a lovely word, and one that rarely finds itself in the same sentence as man made climate change. You will sell the programme worldwide, such is the interest in the subject. I don't even want any payment for the idea-although a credit would be nice. The warmists have steadfastly refused to debate their case, instead they rely on slick pr and for liberal sympathisers to pull the sort of rather silly trick you have-tricks that have been going on since the very start of this nonsensical proposition. Who can forget the deliberate staging of James Hansens Congressional appearance in 1988, when Senator Wirth deliberately (and proudly) chose a hot day and turned off the air conditioning so Hansens testimony on global warming would have more impact. Sadly, the deceit continues to this day and you have become part of it. Whilst I can't do anything about an event that happened 20 years ago in the US, as a taxpayer I think it my duty to do something about the latest episode that has happened in my country. So Susan-there I feel I know you now-why not rehabilitate your reputation for fairness-personal and the BBC's as an institution -and put Co2 on trial? I suspect you might be surprised at the result. This is veryy similar to a technique used by Josef Goebbels. There is a famous example of where, only using primitive wax-recording technology, a speech by Herbert Morrison in 1940 praising Churchill's leadership was spliced together to give the totally opposite impression. How can anyone believe anything they see or hear on the BBC anymore? Hello back. Thank you for at last replying, on behalf of Ms. Watts and all involved in this. And the apology... if only for the delay in reply. I can see how, being the editor of a news programme caught in a sticky situation brought to one's attention in places, such as your own blog, one could forget doing so before now. I wonder what aspect of the blogging software let you down? It seems to have been working fine for quite a while now (or was your first effort 'moderated', which I agree can be 'frustrating'?). It's a pity how often a BBC reply can often seem more like bringing in some Kimberly diamond miners when it comes to digging a deeper hole. I don't propose to address the 'techniques' and what they were intended to facilitate, as others have clearly explained how well it went down. Nor do I intend to get into any discussion of climate, 'optimist' or 'pessimist', save to say as one environmentally concerned erring on caution, 'helping the cause along' by rigging things makes me groan as it makes my efforts at factual persuasion all the harder. However, I do now unfortunately have yet more words and phrases to add to a long, growing and rather ignoble list of 'journalistic'/reportage'/'editorial' doublespeak being used in weak post justification, that does the cause of conveying objective news little credit. The first two seem barely more than excuses for changing things to suit. The third simply a weasel for very stealthily enabling/excusing very stealthy editing. Sorry, not convinced, and it would seem I am not alone. Nil points. Please could you also explain why Newsnight chose to use the extracts from President Obama's speech in that particular order, rather than the order in which they occured?" 1.Obama's words are spliced and re-ordered to suita global warming agenda. 2. Even without the fakery the whole report is propaganda, misrepresenting both the scientific controversy on global warming and Bush's position on stem cell research. 3. Peter Rippon's response on the Watts' blog is demonstrated to be untrue both by listening to the faked section and reading the comments to it. He's simply dug a bigger hole. Both the journalist and the editor should be fired for fundamental breaches of journalistic ethics. Fakery and propaganda - now what? Why am I not suprised by this? When it comes to the BBC and reliable, impartial reporting i'm afraid I lost faith in them a long time ago. They share a large part of the blame for the current mess in which we find ourselves as they are far too supportive of the Labour party. Time and again they fail to report the more mendacious actions of this government, particularly when it comes to Labours authoritarian agenda. Mr Rippon, maybe you ought to re-listen to the piece that was aired and posted online. There are no fades at all. The sound is continuous. President Obama's speech is used on a voiceover on a dull and uninteresting image of Kew Gardens instead the original video which would have revealed the editing breaks of different sentences to form a complete phrase. I'm sorry but this is ethically wrong. Having read these comments and watched the clip in question with its Bush viewpoint I amused myself with the idea that unlike during Clintons tenancy when global average temperature rose slightly it actually fell during Bush's tenancy, as causal as some other links made by some AGWers. As far as I can see the so-called apology from Peter Rippon compounds the original 'error'. Does he think the listners are stupid, there was no indication that the words broadcast on Newsnight were anything other than a direct extract from the inauguration speech. It was faked to provide the narrative that Ms Watts and her editors were looking for. I am sorry to say that the BBC can no longer be trusted. Also how many more times do incompetent journalists have to have it pointed out to them that President Bush did NOT ban stem cell research on embryos in the USA. What he did was to prevent any taxpayers money being used for Fedearl Research for that purpose. The last time I looked the USA prided itself on being a democracy, the nation is divided pretty much down the middle on the ethical issues surrounding such research and in response President Bush agreed that tax dollars should not be used. Sorry to harp on, but I am one (of a rapidly diminishing band) who normally defends the BBC and the license fee against the moronic hordes of Sun readers, Sky viewers and press barons who would rather see an end to both. However, I cannot defend the indefensible, and I would like to hear both an admission that this was out of order and an apology for same. I do believe what I hear from your foreign correspondents, who often risk life and limb, but I am learning to take armchair reports from your studios with a lot more salt, and I may just stop watching them altogether. The BBC position on science is one of total bias and promotion of anti-science and the windbags of socialism that hide behind this insidious movement. Susan Watts, like most enviros, is a propoganda machine who canot stand even to bring herself to utter a word of the worlds scientists who ovewhelmingly reject the man made warming hysteria. Ms. Watts is rarely answerable and never answered one question I've posed. - "They were the words that scientists everywhere wanted to hear and President Obama couldn't have been clearer, promising to "restore science to its rightful place". If Obama did that, global warming hysteria would be over. The UN's IPCC have not found a stitch of evidence against CO2 in their entire 10 years. - "During the Bush presidency, the world saw the Arctic ice cap shrink to a record summer low, the relentless rise of greenhouse gas emissions, and warnings from scientists shift from urgent to panicky." Depends whose scientists you're listening to! During Bushs' presidency the Oregon Petition has grown from 11,000 to 32,000 scientists against the warming propoganda. They're fed up to the back teeth with this socialist propoganda and its about time Ms Watts let them have a voice. - "Scientists have grown used to attempts to silence them. Now, they're speaking out again." Ms Watts is referring to the many scientists being bullied, harranged, threatened, made jobless for not towing the political agenda I presume! When will they get a voice on her programme? - "Just last week a NASA scientist, Jim Hansen, whom Bush had tried to silence in the past warned that Obama has just four years to save the world." Jim Hansen is a known hysteric claiming we would be in an ice age back in the 70's. Far from silence Hansen, Bush couldn't shut him up with 23 press engagements in the 2 months he gagged him. Hansen has received over $400,000 in 'donations' from socialist organisations despite being a public employee at GISS. As for Hansens 4 years to doom message he is being absolutely rediculous as his previous doom warnings and his data realeases have proven. His "1998 the hottest year on record" was exposed as a Y2K bug. When it was exposed he said "the political message was more important than the science". So a clear political agenda more improtant than a rigorous scientific one then! Pathetic bias Ms Watts and undermines your deliberate misleading about "return to science". - "But unlike Bush, Obama does listen to scientists. He's already promoted many to top advisory positions... crucially on energy policy." In short (!) Ms Watts programes are consistently biased as are the Newsnight team and the entire BBC on the real science going on about climate. They've snuffed out major studies that expose there is no greenhouse signature 10kms up in the atmosphere. Ignored the truth about Earths temperature record and Antarcticas. And the BBC continues to be out of step with the majority of the worlds scientists on record to have spoken up against the ever more shrill attempt to con us all into another bankrupt era of socialism. Thank heavens for the internet. If it was left to the bias and bent BBC we'd never hear the truth. Another thing Susan. The people who have taken your essay at fave value, and as a result believe that BO is commited to fighting AGW are in for a bit of a let down. If BO's speech proved one thing, it is that the issue combating "climate change" is way down the agenda, it's almost as though BO knows that it will become a non-issue during his tenure. Here is the latest version of the "Hockey stick" as you can see, proxies give some interesting results !! i.e. 'warring', not 'warming'. Oh dear! The ability to digitally create, manipulate and copy audio-visual material, including still photographs, video and documents poses ethical dilemmas and creates the potential for hoaxing. We should ensure that any digital manipulation, including the use of CGI or other production techniques to create scenes or characters, does not distort the meaning of events, alter the impact of genuine material or otherwise seriously mislead our audiences." Well, it would be nice to have this better explained than it has been, and before the post thread drops off the page. I for one am certainly more than a little bemused by all this jiggery-pokery that does indeed seem, for whatever reason, to have been designed to contravene the spirit and fact of the guidelines you have kindly sourced and shared. I might just make a note to stay with this one. We, at the media watchdog StinkyJournalism.org have published a report that quotes US media experts regarding this breach of media ethics. “The editing took what was historic, witnessed by millions of viewers and listeners and made it untrue. Something as historic as an inauguration speech should not be tampered with. This is different than clipping ‘ands’ or ‘uhs’ from an interview with a sports figure in a locker room interview. This is rearranging a speech. The Society of Professional Journalists code of ethics states: "Admit mistakes and correct them promptly." Do the right thing. The public is waiting. For a so-called "public service" broadcaster who is supposedly upholding fairness and not to show bias the BBC has alot to answer for on the climate con manipulated by the failed socialists of the 80's and 90's. The enviro wind bags should certainly be congratulated for keeping this vacuous climate movement going despite having no science to sustain their propoganda! When will BBC Newsnight and Ms. Watts have a proper debate on air instead of cherry picking Labour politcians alongside George Monbiot of the Guardian and snuffing out the powerful voices of real scientists? Will BBC Newsnight concede there is no "consensus" (another of dozens of false claims by AGW advocates over the years) and that the majority of the scientists in the world on record overwhelmingly regard AGW as junk science? When will BBC Newsnight and the biased Ms Watts reflect that view in their programmes and allow them a voice? This propoganda wind farm at the BBC is running out of hot air. The days of biased reporting are long gone, you're kidding nobody but yourselves you can get away with it any longer. It's now about 9 days since people discovered this serious fakery Susan but we have not seen an iota of either an explanation or apology from you. Should we still wait for that or are you hoping that we, the licence fee payers, stop demanding some degree of standard from you and go away? "It's now about 9 days.."
It is not for the plebs to ask questions. Just think what you are supposed to, and accept what the BBC tells you. Meanwhile you can continue to pay for the BBC's inflated salaries - under threat of imprisonment. Plus, of course, what it chooses not to. For instance, this 'affair' has now dropped off the front page but not my bookmark list (sadly not for the best of reasons - and I can't believe only I and one other cared to comment on it, so there must be reasons). And all I was asking was why something they wrote was moving in such mysterious ways. Ah well, all useful when discussing the 'legal' basis of the 'service contract' that is imposed upon me. Whoops. Put the link out of sequence. This thread's 'affair' has indeed had a fair share of input! Ms Watts displays all the 'deaf, dumb and blind' characterists of this tragic Labour Government and their climate science. Don't be surprised she won't answer her articles spin, propoganda and inaccuracies. That would involve a debate about pros and cons and if there's one thing patent in any discourse it's that the AGW crew are out of bullets (science) to support their insidious political agenda. The scoundrels have been caught stone cold and are laying low in the hope that timewasting will save them. Alas they're probably right. I'd like to add my name to those who are waiting for your reply. That is good news, that in President Obama adminstration....Science affairs will be taken to its rightful place. "Restoring science to its rightful place". How about restoring the various bits of Obama's speech to their rightful places? "We did edit sections of the speech to reflect the elements in it that referred to Science." Note the word "reflect" as in "reverse". When is Newsnight going to apologise for this and issue a correction? Susan Watts, when are you going to clarify your role in this? At the moment, you are, probably wrongly, getting the blame for editing the speech. Who did edit the speech, taking separate snippets and gluing them together in the wrong order? A great Blog article in which you candidly and unashamedly lay bare your innermost sentiments for all to see! I like that level of honesty in a person, irrespective of how much I agree/disagree with their views. I will, be more than happy to, write this off as an aberration that misrepresented your journalistic credentials if you respond to the many sincere and polite requests given by previous respondents! Actually, as a simple man let me simplify, answer Samuel Pickwick @ 73 and that'll do just fine! The opportunity to respond/refute is yours- nil-response would equate to arrogance, uncertainty or worst of all for your employers - insouciance! Your words serve only to propagandize the orthodoxical view of global warming. As you write of the restoration of science to its rightful place, Al Gore's propaganda film has been judged to contain numerous scientific errors of fact. Although Gore isn't a scientist, his exposure in the GW literature seem to have elevated him to that lofty status. His errors in the Inconvenient Truth helped put climate science in a bad light, particularly after a British court ruled that these errors must be pointed out when showing the film in public schools. James Hansen (of NASA fame) is a scientist who shows himself to be an environmental zealot who interjects his unabashed views and opinions in the political arena whenever possible, no matter how outrageous they are. The existance of an ever increasing number of credible scientists who dispute the GW orthodoxy do not make the public feel that science can reliably explain what's going on with the climate. Science actually has no "rightful place" in climate science, yet. It is currently in vogue for writers to link skepticism for GW science with the Bush administration's unpopularity. This requires no original thought on the writer's part to do so. Everybody is doing it, right? By associating the evil demon Bush with global warming, you intend that skepticism for the science is to be marginalized and discredited. It's a propaganda talking point. It is also currently in vogue to link support for GW orthodoxy to Barak Obama's administration, since he actively supports it. If he supports the orthodoxy, it must be TRUE! Obama can't be wrong! Never mind that he seeks the counsel of Al Gore and James Hansen. Never mind that the debate that's over has never occured. You cite the diminishing summer Arctic ice as evidence that GW is occuring, while ignoring that the "Northwest Passage" was navigable in 1903 (see Wikipedia). This puts forth yet another bias for your unsuspecting readers to absorb. If most readers don't know the Arctic ice cleared out 105 years ago (before man made CO2 was a factor), they have no choice but to accept your words as fact. As your readers gradually come to know of this omission, the "rightful place" for science will be further set back. You are guilty of cherry picking the facts. Public ignorance empowers the propagandist, doesn't it? Does it strike you as odd that scientists who support GW science receive government grants, and scientists whose research contradicts the orthodoxy receive no such grants? Is science "riding high" when skeptical scientists find that they've lost their grants, are villified publicly and professionally, or are sacked? Is science riding high when GW scientists in the "good old boy" network peer review each other's work? Is science riding high when pitifully little consideration is given to alternative hypotheses for GW? Is science riding high when scientists refuse to allow access to their research data with fellow scientists? Yes, Ms. Watts, you write propaganda. In so doing, you demonstrate a serious lack of objectivity. I suggest you find out who the credible scientist-skeptics are who show the integrity to stand up against the orthodoxy. I suggest you find out why these skeptics believe they are right. I doubt you would do this, lest you find yourself in the unemployment line. Like it or not, Madam, you are a servant of the global warming orthodoxy. I'd like to add my name to the list here, of people wanting the BBC to come clean. I used to believe in Anthropogenic Global Warming - until a year ago. What I found out then horrified me so much that I wrote up a Primer on the real Climate Science so that readers could ask questions, verify the evidence, and check the truth for themselves - since the real debate that should be welcomed is being squashed at BBC and elsewhere, by those who falsely claim "the debate is over". By the excellence of the science on the sceptics' forums, and by their growing membership, we know the debate is NOT over, and that BBC is regarded, sadly, with less and less respect. Please do the right thing and help organize a real debate. Show me the warming please. Your article, like previous I've complained about, demonstrates your patent bias for AGW advocates. If you honestly support the "upholding of science" then you know scepticism is a first order attitude of scientists. Yet you consistently display one sided bias for one side of the argument and no scepticism. In short all the characteristics of a political agenda and none of real science. Your biased discription of Dr James Hansens being gagged by President Bush and he being hard done by is further evidence of your bias and politics. You trip over yourself so often its embarrassing to watch. The BBC's programme bias over the past couple of years or more and Newsnights consistent bias demonstrates the blinkered view of AGW advocates the "debate is over" yet where have we seen such debate on the BBC? You wear your bias on your sleeve and your propoganda is of such poor quality it may be time you consider your position. If this continues along with your insidious silence you, and BBC personal, can be expecting a scandal. Either take an ethical honest scientific position and take your responsibilities regards balanced public broadcasting seriously or continue to trip up again and be dragged over the coals for what is frankly a very dishonest way of going about your job. 2008 Antarctic ice anomaly reached a recorded high of +2 million square kilometers. Yours, helping to restore science to its rightful place. "the old Harry series (archived on GISS as of 2008) was identical to the data from another station called Gill. The Gill station is located somewhere else entirely"
"It turns out that new Harry–as used by Steig–is a splice of Gill and some relatively recent Harry data." "Are other Antarctic series in Steig similarly fouled up?" "What happens to [the] results if new Harry is either deleted or replaced with a West Antarctic station that is not a splice of 2 unrelated sites, if such a series is available?" This is worth a read too, Susan. Susan..? "It turns out that new Harry as used by Steig is a splice of Gill and some relatively recent Harry data." If global warming is one of the most significant challenges facing mankind, it must surely be put to the test of public opinion in an adversarial arena. As a respected player in the media, the BBC surely has a central part to play in brining the issues to the public in an even-handed way. However I do wonder whether the BBC has the stomach for this important job. The easiest thing to do is to fall into line with what is popular - and not question the rights and wrongs of the scientific basis. It is highly readable , and only gets technical with references to a couple of statistical tests - these points can be accepted without losing the thread. You don't need to be any more technical than following the trend in a handful of graphs. The hardest part of the paper is keeping track with references to a number of foreign place names where tree ring samples were gathered. Please give this your attention. To repeat - there are genuine issues of public concern in this. Returning to the most recent gaffe from a rather limited clique of climatologists. fjpickett said "Splicing data together is clearly beyond the pale." I know what you mean fjpickett, but I do not believe there is any suggestion of malfeasance in this. Best put it down to complete incompetence. I understand the Automatic Weather Stations transmit signals using a limited number of radio channels. Two of these appear to have been crossed, and therefore "Harry" got mixed with "Gill". It is relevant to ask what quality control and due diligence procedures were operated by the researchers. Non-existent by the look of things - a whiff of the expected result and before anybody stopped to ask relevant questions it seems to have found its way onto the cover of "Nature". The paper I linked above is relevant to all of these points. The author reviews other instances of poor quality control and dubious analysis. I would add that there are obvious concerns about "journal peer review". This is a final quality control procedure, more to protect the reputation of the journal. It does not excuse researchers from their own quality control and diligence, but may serve as a last chance to spot obvious errors. However, it says quite a lot about the state of the art when climateaudit.org spotted a glaring error within a couple of weeks of publication. Speaking of places, if not what I'd call 'rightful', as I have bookmarked this for the odd return every so often I am disappointed that it seems to have been consigned to the bottom drawer. Bearing in mind that I am still seeing this episode mentioned internationally, it seems less than satisfactory to 'hope it goes away'. Re #83 by gufpott, this is a similar point to the one I've been trying to make (without a lot of success) on George Monbiot's blog in the Guardian Online. Whether or not the errors in the Steig/Mann study were due to simple carelessness or something less excusable, they should have absolutely been picked up and corrected at an early stage - I would agree that it is a matter of quality control, and best practice. I'm thinking of it this way - if you were worried about your house falling down, and these people were structural engineers, would you trust them to get their calculations right, without intervention from some outside agency? If their report stated that yes, your house was in danger of falling down, how much confidence would you have in their conclusion? Climate Audit disappeared. Who would bring these kinds of error to light, in that case? I have just looked at the clip again. Then I read Peter Rippon's comment. Then I went back and listened the clip again. Then I read Peter Rippon's comment again. I really can't believe it. There are no fades at all. Peter Rippon's comment "This was signposted to audiences with fades between each point" is a blatant falsehood. What puzzles me is why he should write something that anyone can check, by clicking on the clip, is false. I was also wondering why the clip was shown with a picture of Kew Gardens instead of Obama giving his speech. The reason, of course, is that had Newsnight shown Obama, the splices would have been obvious. An essential part of the deception was to avoid showing the man speaking. I should say that I am puzzled as to why the moderators deemed the link to Steve McIntyre's paper to be unsuitable. An explanation would be helpful. I referred to this work because Steve McIntyre is a very good mathematician who is recognised for having raised substantive issues with recent analysis reported in the journals. McIntyre's paper provides a summary of some of his concerns about the use of tree rings as temperature proxies. The importance to the global warming hypothesis should not be understated - precisely the reason why he is talking about it. The "AGW" hypothesis says something along the lines of: unprecedented global temperature will follow unprecedented levels of atmospheric CO2. We are told that all possible causes of temperature variation have been accounted for: as such it is claimed that CO2 is the only factor which can explain Recent Warming. The existince (or not) of the Medieval Warm Period is therefore a central issue. If there was a Medieval Warm Period, what must have caused it? The ice core records say it wasn't CO2. It is claimed that solar variation is insufficient to cause the required variation. 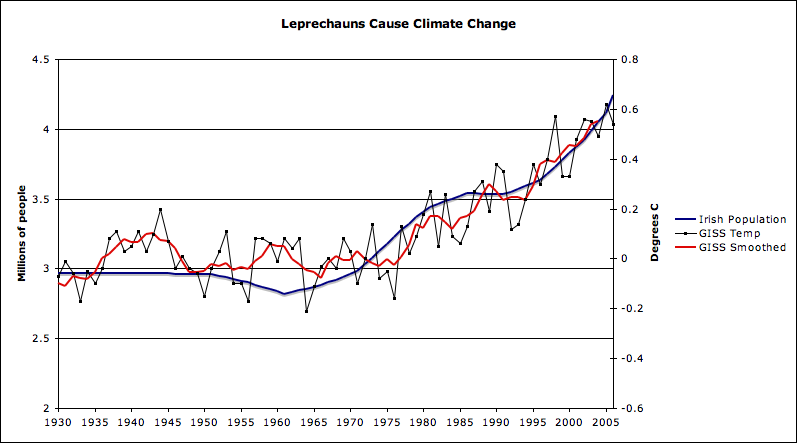 On these points, we can say that a Medieval Warm Period would contradict the AGW hypothesis. This is why the Hockey Stick and its sisters have had such a prominant position in the evidence for AGW. Avoiding URLs, a copy can be obtained on the www if you search carefully. Loehle compiled an index of 18 peer reviewed temperature reconstructions. All calibrated and stated in degrees Centigrade in the original peer reviewed reports. The series are from various types of temperature proxies, taken from locations which are quite well distributed across the globe. As a condition of the analysis, Loehle avoided tree ring proxy series (given the scientific controversy following from McIntyre's concerns). Loehle's reconstruction indicates a Medieval Warm Period which peaked around 1000 years ago. The peak is estimated to be 0.3dC above present global temperature levels. I appreciate Mr Rippon's explanation but I thought it was a little long winded for people to take in. I have adjusted it to make it a little more readable. I wrote an official complaint 3 weeks ago through the main BBC web site. So far I’ve received no reply at all. A blog where the author fails to respond to comments is extremely poor. Presumably Susan has no valid defence so is unable to answer. I too made an official complaint about then. Nothing. The more I think about the stranger it seems. A complaint via the BBC's forms should surely generate an acknowledgement email so that one can follow it up. In this case, there was nothing. This is an obvious scandal where the BBC's been caught stone cold re-ordering the words of the US President to fit it's Global Warming bias. There's really no argument, so it seems that the complaint just gets disappeared. I have come to suspect that within the BBC complaints are now viewed as 'emerging compliments', whereby total frustration with their antics is cheerfully respun as basic support. And then, I am sure, relogged as such with much ticking of compliance boxes. I am sure the pie charts the Trust looks at as a consequence are quite clear on the matter. Hey, you don't get what you have to pay for. Thanks for your e-mail about Newsnight' on 20 January. Please accept our apologies for the delay in replying. We know our correspondents appreciate a quick response and we are sorry you have had to wait on this occasion. I understand that you felt a report on President Obama's plans for the environment had been misleadingly edited. This was one part of a 50 minute programme exploring the start of the Obama presidency from various angles. 'Newsnight' edited sections of the speech to reflect the elements in it that referred to science as a way to give people an impression or montage of what President Obama said about science in his inauguration speech. This was signposted to audiences with fades between each point. It in no way altered the meaning or misrepresented what the President was saying. The report then went on to explore the challenges facing the President in this area. However, I can assure you that your comments have been fully registered on our audience log. This log is made available to all members of the BBC, including the production team of 'Newsnight' and senior BBC management. This is an unsatisfactory response in several ways. Not least, did you listen to the report? There were no fades as attested by my ears and all the ears of all the other correspondents on Susan Watts' blog. I made this point in my complaint and more than a month later you ignore it. You can see from the thread on the blog and from the contemporary entry on biased-bbc.com that this is a high profile issue where the BBC has been caught stone cold manipulating Obama's inaugural speech to suit its own agenda. In view of your Stalinesque refusal to deal with the plain facts of the case I wish to take this issue to the next stage - what is that? The BBC Trust? Please advise. Sadly, probably true. And in this process over result, box-ticking, bonus-driven public 'service'-dominated culture we are spiraling down into, our adding to these threads will probably be deemed a 'success', no matter what we are saying or that they are not replying. And, even more sadly, it will probably work. I... you... will get bored, fed up or simply forget eventually when it drops off the archive list and can all be neatly forgotten. Were my tardiness in paying the licence fee, through doubts on the delivery of content as required by Charter, treated in the same way. The complaints system is a farce, that seems to serve no function other than to provide yet more brain-dead, on-message, group-think employees more salaries and pensions. I eventually got back a 'reply' to the Gaza situation 'reporting' that 'understood why I was upset they were not running the appeal, but... etc. They hadn't even read what I'd written! I wasn't complaining about the appeal, pro or con running it, at all, though that was included in my disgust at the news management at play. Yet my 'support' will doubtless be used at a future date in one of the BBC's dodgy research outings to back up whatever agenda is being promoted next. I have never felt so disenfranchised in my life. At least there is some chance I can influence who runs the country, and how they do it, with my mandate, every few years. With the BBC I get what I'm given and told to lump it. And then to add injury to insult am required pay for the privilege. Here is the reply I received today from Susan Watts; followed by my reply. Thank you for your message (below) - which was forwarded to me, and received on February 19th. The report you refer to was one part of a 50 min programme exploring the start of the Obama presidency from various angles. We edited sections of president Obama's inauguration speech to reflect the elements in it that referred to Science and the environment - as a way to give people an impression or montage of the relevant sections. This was signposted to audiences with fades between each point. It in no way altered the meaning of, or misrepresented, what the president was saying. Thank you for your reply to my complaint. Your explanation is virtually word for word the same as that given by Peter Rippon on your blog on 24th January. It is not only my view, but the view of many others who have written on you blog, that your explanation is unsatisfactory and that the editing did in fact change the meaning and misrepresent what the president actually said. Please acknowledge this fact or refer the matter to a higher authority at the BBC for consideration. Well, I do declare. Cookie-cutter template 'responses' masquerading as public service addressing of legitimate concerns voiced/written by those who are required to pay their salaries. You had a reply from Susan Watts? Indeed. I rarely get anything from the object of the complaint, and when I have it has usually been because they really can't see why anyone would not share their views and hence needs to be berated. Usually it's from a munchkin with a nifty title, and starts off apologising for the delay as 'they' don't like to be seen to be tardy...yadayada. Then it's straight into the 'It didn't happen. And if it did happen it wasn't like what you say. But if it was like what you say it doesn't matter. And anyway what can you do about it really, as we're untouchable, so all this job really is is a way to look like we're concerned but actually just happy to bolt on more pay and pension parasites to the roster. This will be filed to laugh at at the month's end outreach bonding event where we have a nice party and pretend to be more aware of stuff'. As you'll gather, I see value in getting the number of comments to the ton, at least. But might just keep dropping by anyway to up the ante in case they get teased enough to actually respond. Hello again people; just checking what's new. It is interesting you still think you've any kind of real say in how the country is run 'JunkkMale'; have you not noticed how similar the three main parties actually are? Anybody who offers any real alternatives is branded 'extremist'; 'radical'; or whatever, and is effectively censored. Anyway; it seems that the only thing that may really get the BBC's attention is if their money dries up. Lots of people are unhappy with the BBC and their bias in other areas as well; notably the EU. A group of people calling themselves "The People's United Community" (tpuc.org) already have a campaign going. I think our concerns are quite legitimate, and since the bias is ongoing: I think it is quite reasonable to withhold the license fee. I believe such action to be quite lawful, so long as the right procedure is followed. The BBC should not be there for propaganda purposes (surely not a part of its Charter), and that is not what we pay them for. First of all I think one should serve notice of intent. If things are still not resolved, then one can simply claim the right not to pay (a second letter). Visit the TPUC website for more information from people who have already been through the process. I suppose it takes a certain amount of balls to do. It seems to me that one needs to take a stand at some point though. The 'powers that be' are taking liberties left, right and centre. How long do we wait before acting to remedy the situation? If we are too complacent, the fires of tyranny will be so out of control they'll consume everything! They rely on people being lazy, ignorant, and afraid. These people are there to serve us remember! They only have the power, while we allow them to!